Rapid Results College is such a great name for a band, cemented in modern urban life with tongue firmly in cheek about its pressures, pace and pitfalls. Their debut album In City Light keeps this ethos going, offering the band’s particular take on modern life from the horrors, quite literally, of dating (The Cautionary Tale of Alphonse Du Gard) to its frantic pace, on the track Rapid Results. The delivery too is clean and precise, like a freshly swept city pavement early in the morning. This draws out the best in the simple sound of former The Hillfields frontman Rob Boyd’s guitar and vocals, Mike Stone’s (Television Personalities and Rotifer) bass and the drums of Owain Evans. Knowing that Stone is a fan of XTC it was no surprise to hear the influence of the legendary Swindon act here. This is particularly on Rapid Results, which offers up glimpses of XTC tracks King for a Day on the guitar intro and Towers of London in the middle eight. Another Wiltshire act, Co-Pilgrim, is another point of reference as an act that uses a clean sound to draw out melody. Rapid Results is just one of many hightlights, which also include the album’s best pop track Any Other Way and the aforementioned The Cautionary Tale of Alphonse Du Gard, where a date, possibly arranged through something Tinder, goes horrifically array. 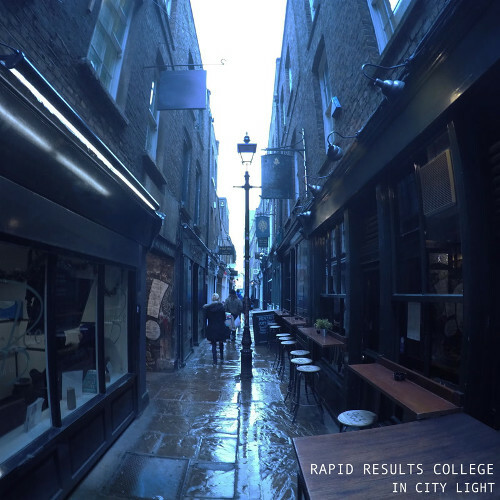 Rapid Results College – In City Light is released by Gare Du Nord. For more information click here.